I saw my first stage play when I was 12. The local fire brigade organised discount tickets for all the kids in our area and took us into the city to see a production of Phantom of the Opera. From that day, I was hooked. I've been to many different plays since then, with many different people. When I can't find someone who wants to go, Husband is always willing to come along. But since he visibly glazes over and can barely restrain himself from falling asleep he's not my companion of choice. So I was thrilled when Maddy showed an interest in going to plays with me. Since her first time, (Chicago) we've been to Mary Poppins ( on Broadway in New York! ), Wicked, and now Legally Blonde. 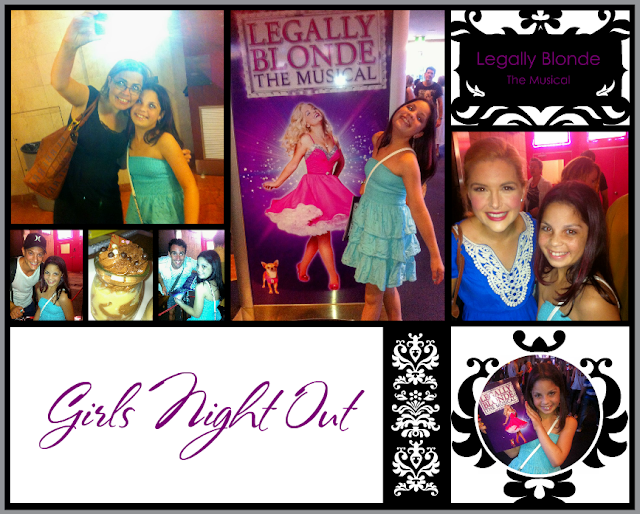 This week, as a birthday surprise, she and I went and saw Legally Blonde at The Star. We made good time into the city, and had dinner first at the buffet. Although expensive ($36.90 for an adult, $16.90 for a child) the buffet had a good variety that suited both of us. Although frankly, the desert bar was so good that I didn't enforce eating a good meal and both of us went a little nuts sampling eclairs, cakes, mousses, and the chocolate fountain/lolly bar. Meh, it's her birthday treat, what do I care if she scoffs an extra eclair instead of a potato. The play itself though was FABULOUS! (OMIGOD You guys!) Lucy Durack is a perfect choice for the role of Elle Woods, although I have to wonder if she will be able to move away from the flippant blonde character to play something else since she plays these so well. Just in case you didn't see it, Lucy was also Glinda in the stage play Wicked, which is a pretty similar character. The music was catchy, the stage looked incredible, and I was hooked from the opening number. Maddy doesn't sit with her mouth open the way I did at her age. She has a huge grin, she sings along with the chorus, and throws her head back with laughter at the best lines. She's the best person to go to a show with, money well spent. I love that she is old enough to enjoy these shows with me, and that we have this in common. Afterwards we raced around to the stage door, the first time I have ever done that. I've always wanted to, but never really thought it would be as easy as it was! As luck would have it, we made it round before any of the cast started to emerge, and we were lucky enough to meet and chat briefly with all of the lead cast. Maddy had them all sign her program as well, and I have to say just how sweet they all were. There was no impatience at being delayed going home, Cameron Daddo propped his bike and helmet against the wall and spent easily 30 minutes working his way through all the fans as did Lucy and Rob and all the rest. Most of the minor characters hurried past without stopping to chat, but I wonder if that was more a belief that people weren't interested in them, than a lack of interest. WRONG, my kid would have loved to say hello to everyone. We had the best time - if you haven't seen it, I can highly recommend it, I think the show closes in Sydney shortly and heads off interstate so there is still time no matter where you are. Definitely a show to take your daughter to. My tip though - wear pink! As soon as we got there Maddy and I realised we were wearing the wrong colours. I would have loved to have gotten into the spirit of things a little more. Do you love theatre too? Who do you go with? I'm very annoyed. I just wrote a big comment and then accidentally clicked in the wrong spot and lost the lot! Frustrating! I do that all the time! I always copy my comments or competition entries every five seconds because I am always losing my comments.